Gesneriad Society Student Convention Grants - Deadline Extended, May 1st. 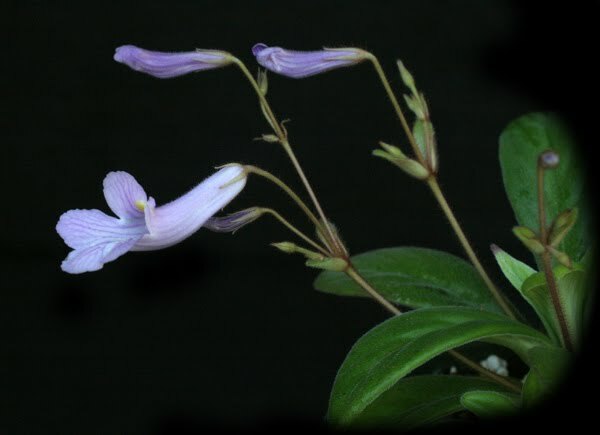 We are pleased to announce the Gesneriad Society Student Convention Grants to be awarded to students interested in or actively studying the plant family Gesneriaceae. The grants will provide registration and accommodation costs for students to attend this year's convention to be held July 5-9 in Philadelphia, Pennsylvania. Visit www.gesneriadsociety.org/conv2011 for more information. ● Your name, institutional affiliation, and all contact information including address, telephone, and email. ● A 500-word or less description of why you should attend the convention including comments about your education and research goals and how attending convention will help advance these goals (sign and scan it to PDF). ● Your curriculum vitae, not to exceed two US letter-sized pages (scan and include in the single PDF). ● A letter of recommendation signed by your major advisor or faculty representative (scan and include in the single PDF). ● The title and brief description of your poster or talk (please specify) to be presented at convention. Grant recipients will be notified by email of their award status by May 1, 2011. Awards will cover all convention meals and activities costs (refer to the website noted above) and registration as well as shared room accommodations for up to five nights during the convention. Travel to and from convention, other meals not included in the convention program, and incidentals will be at the expense of each student. It is with great reservation and a degree of sadness that I must inform you of my resignation as Director of the Gesneriad Research Center and Head of Molecular Programs at Selby Gardens. My decision to leave was a difficult one, owing to my long history with Selby and my fondness for its mission and staff. On February 1st, I begin my new position as Senior Plant Ecologist for the Catalina Island Conservancy in California (www.catalinaconservancy.org). While at Selby and even before, my intention was to advance the mission of the Gardens and The Gesneriad Society, ideally at the same time. The goal was to build institutional capacity at Selby beyond a specific project or even a specific plant group. Rather, research at Selby would be modeled after other successful botanical garden research programs where scholarship through research and graduate-level training fuel continued advancements. With financial backing from members and supporters of The Gesneriad Society and the Institute of Museum and Library Services, we were able to make great headway in this regard. I was able to forge a solid research program at Selby complete with the first ever molecular research laboratory in the Gardens' history. I also made great advances in establishing collaborative ties with regional and international institutions, ties that would be vital to establishing a graduate-level training program at the Gardens. Also in the vein of collaboration and education, we held the World Gesneriad Research Conference 2010 at Selby Gardens this last October which I had the honor of chairing. One of the greatest highlights of my career to date, WGRC 2010 was a resounding success with excellent participation of scientists, students, and enthusiasts from around the world. We accomplished much over the last two and a half years and I am proud to say that I was a part of it. Despite my leaving Selby Gardens, I remain a supporter and proponent of Selby as an institution of learning and scholarship. Selby has always had great potential and I am continually amazed at the breadth and quality of research (and botanists) that Selby has produced over the last 35 years. This legacy has never been attached to an individual or even a group of people. It is the product of a founding wisdom and a collective realization that there is something profound tucked away on the Bay in Sarasota. Now more than ever, Selby Gardens needs your support. I encourage all of you to take a more active role in the future of the Marie Selby Botanical Gardens. The Gesneriad Society also needs our allegiance. TGS, as much or more so than any other lay plant society, supports research both financially and intellectually. I am a direct product of this support: from my early days curating the Wiehler collections at Selby, to my graduate research involving expeditions around the world, to the GRC and gesneriad research at Selby Gardens, TGS has been there. Please consider what you can do to help keep The Gesneriad Society strong and viable well into the 21st Century. Current and future students of Gesneriaceae are depending on it. As for me, it is difficult to leave behind the GRC and Selby Gardens, but I am thrilled to embark on this new endeavor with the Conservancy. My role as Senior Plant Ecologist will be multifaceted and allow me the opportunity to utilize my various skills in support of the Conservancy's mission in conservation and sustainability. I also will be continuing my role as a member of the Board of Directors for The Gesneriad Society and will remain the program coordinator for the Gesneriad Conservation Alliance. The next several years promise to be very busy but incredibly rewarding. I wish to personally thank Selby Gardens, The Gesneriad Society, and all the individuals who have supported me as I have grown as a scientist and researcher. I hope to see many of you often at gesneriad meetings and events as well as scientific conferences and the like. Of course, you are all invited to visit Catalina whenever you want to see firsthand what the next chapter in my life is all about. The World Gesneriad Research Conference 2010 (WGRC 2010) was an international meeting of the world’s Gesneriacae researchers, students and lay enthusiasts who came together with the goal of understanding and promoting knowledge of the plant family Gesneriaceae (the African violet family and one of the core group of plants under study at Selby Gardens). The conference was held October 13-15, 2010 at the Marie Selby Botanical Gardens in Sarasota, FL, USA. Over 70 people from around the world attended WGRC 2010, with registrants from North and South America, Europe, and Asia. Attendees were rewarded with 34 oral presentations by researchers and students, with topics covered including phylogeny and taxonomy, biogeography, floristics, development and reproduction, and education and conservation. WGRC 2010 was principally organized by Dr. John R. Clark, Head of Molecular Programs at Selby Gardens and Jeanne Katzenstein, The Gesneriad Society, with a great deal of assistance from Bruce Holst and other Selby Gardens staff and volunteers. The conference has been deemed a complete success, with many attendees commenting on the scope and professionalism of the event. Among the species featured, a Cyrtandra platyphylla (Gesneriaceae) is prominently displayed near the middle of the sheet. Cyrtandra is the largest genus in the Gesneriaceae (~600 species) and is particularly diverse in Hawaii, with 58 recognized species native to this archipelago (Wagner, Clark and Roalson, in prep.). "Gesneriads Around the World" is the gesneriad exhibition, show, and sale (October 16 and 17) that will immediately follow the World Gesneriad Research Conference 2010 (October 13-15). Saturday, 16 October, 1:00 P.M. - 5:00 P.M.
Sunday, 17 October, 10:00 A.M. - 3:00 P.M.
All individuals registered for WGRC 2010 will have admission to the show as part of their registration fee. For individuals and parties interested in attending the flower show, but who are not planning on attending the conference, Selby Gardens has graciously offered two for one admission to the Gardens for those visiting expressly for the show. To receive the discounted rate, simply download the coupon image below and print it out. Bring the coupon with you for two for one admission (or half price admission for one) on either Saturday, October 16th or Sunday, October 17th, 2010. The show promises to be a diverse and beautiful collection of the world's gesneriads. There will be both expert growers and gesneriad scientists on hand to answer questions. There will also be plenty of plants for sale so you can start your own collection of gesneriads. We hope to see you at Selby Gardens for Gesneriads Around the World. We are pleased to announce The Hans Wiehler Student Travel Award to be given to students and/or beginning researchers for attending the World Gesneriad Research Conference 2010 in Sarasota, FL, USA. This fund has been established to promote participation and community among today's researchers and to foster scholarship in students of the family. Awards will be issued on a competitive basis. To apply, send the following materials in a single PDF document to wgrc2010@gmail.com with the attention line: HANS WIEHLER STUDENT TRAVEL AWARD. 1) Include your name, institutional affiliation, all contact information including address, telephone and email. 2) A 500 word or less description of why you should attend WGRC 2010. Be sure to include comments on your education and research goals and how attending WGRC 2010 will help advance these goals. Please sign the letter (and scan to PDF). 3) Your curriculum vitae, not to exceed two US letter size pages (CV's exceeding two pages will not be accepted). 4) Letter of recommendation from your major advisor, signed (scan and include in the single PDF). Label the file exactly as done in the following example: John R. Clark would label his file Clark_JR_Wiehler_Travel_Fund_2010.pdf (i.e., last name, underscore, first and middle initials - no dots or spaces, underscore, Wiehler_Travel_Fund.pdf). Applications submitted as multiple documents and/or in a different format (e.g., MS Word document) will not be reviewed with the exception for unavoidable technical limitations (e.g., no access to a scanner or program to assemble the single PDF document). In the latter case, contact the WGRC 2010 Registrar (wgrc2010@gmail.com) well in advance of the deadline to make other arrangements. Applications exceeding the specified length for description and CV will not be reviewed. Review of applications will begin immediately after the deadline. Award recipients will be notified as soon as possible to expedite airline and hotel bookings as required. However, funds will not be issued until the conference - students will need to cover these costs in advance. All applicants will be notified by email of their award status prior to the conference. Thank you. We look forward to receiving your applications. 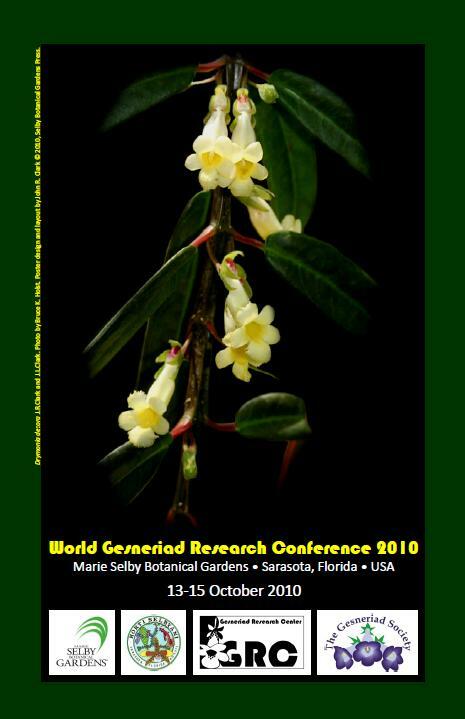 On-line Registration for the World Gesneriad Research Conference 2010 is now open. Please click on the link in the right hand column of the GRC blog for more information and to register. Or go straight to the WGRC 2010 registration site: Register Now! On the link you will find detailed information on registration, a general schedule, information on hotels, travel, other important considerations, and more. Registration is easy and takes just a few minutes. All registration is being handled through our on-line provider 123Signup, the same outfit that has been handling The Gesneriad Society Annual Convention for several years now. Those of you familiar with registering for Convention will know exactly what to do. For everyone else, the site is user friendly. If at any time you have questions concerning the conference, please contact the WGRC 2010 Registrar at wgrc2010@gmail.com. Welcome to the Gesneriad Research Center's Blog! The GRC is the center in North America for botanical research on the plant family Gesneriaceae. Here on the GRC blog, you will find updates on GRC activities including research, education and conservation efforts. It's easy to subscribe to the GRC blog (see below) to get email notifications of entries and updates so you will always know the latest. Thank you for your interest in the GRC. Subscribe to the GRC blog. To increase and diffuse knowledge of the flowering plant family Gesneriaceae through exploration, research, professional collaborations, and education, and to facilitate conservation initiatives that benefit gesneriads and the tropical ecosystems where they occur. Gesneriads (pronounced "guess-NARE-ee-ads") are tropical plants in the plant family Gesneriaceae, a diverse group of species that range in size from small teacup-sized windowsill plants to trees taller than a house. Commonly known gesneriads include African violets (Saintpaulia) and lipstick plants (Aeschynanthus). Gesneriads are often quite striking, exhibiting a wide range of growth forms, flower colors and fruit types. In all, there are over 3000 species of gesneriads found throughout the world's tropical forests. The Gesneriad Research Center was founded in 2007 to coordinate and conduct research and conservation geared towards understanding and preserving this important family of flowering plants.